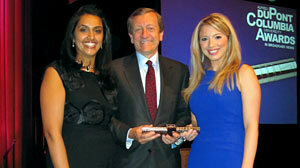 ABC News Receives duPont Award for 'The Coach's Secret' Reporting. USA Swimming, the sport's national governing body, launched a new background check program this week, requiring all coaches, employees, volunteers and anyone else working with swimmers to pass a criminal background check. USA Swimming, the sport's national governing body, launched a new background check program this week, requiring all coaches, employees, volunteers and anyone else working with swimmers to pass a criminal background check. The move comes nine months after an ABC News 20/20 investigation revealed that 36 USA Swimming coaches had been quietly banned from the organization for sexual abuse of young swimmers they coached. Last night, the reporting team received an Alfred I. duPont-Columbia University Award for the initial 20/20 report, 'The Coach's Secret,' as well as follow-up articles on the web and the resulting impact of the ABC News coverage. USA Swimming's new background check requirement is "designed to deter individuals who should not be working with athletes from ever applying for membership," the organization said on its web site. "Additionally, it serves to identify any unsuitable criminal history of those individuals who do apply for membership." Click here to read the full list of expanded USA Swimming Athlete Protection Measures and Best Practice Guidelines. Individuals working with swimmers who have never had a background check must now do so through Acxiom Information Security Services, Inc. by Feb. 15. "This group includes the vast majority of the officials in USA Swimming," said one local swim club in Virginia on its web site, "a very large number of individuals." The background check includes a national database search for criminal convictions, including a sexual offender search in all states and other watch lists from national and international databases. There are also additional county criminal searches in places of previous residence. Individuals will automatically be disqualified from USA Swimming for any felony or misdemeanor involving a sexual crime. Other disqualifiers include convictions, deferred sentences or pending charges of violence, crimes involving firearms, animal abuse, drug use or possession, and child endangerment, neglect or abuse. The background check is valid for two years and is repeated monthly. The 20/20 investigation "The Coach's Secret" revealed that San Jose swimming coach Andy King had received a clean bill of health in 2008 from USA Swimming's existing background check program, even though he abused more than a dozen teen female victims over three decades up and down the West Coast. Less than one year after being approved again by USA Swimming, King was abusing a 12-year-old girl in a shed during swim practices. The 20/20 report led the U.S. Olympic Committee to announce it would centralize and standardize background check programs across all 32 Olympic sports, affecting approximately one million athletes. WATCH PART 1 of the 20/20 investigation. WATCH PART 2 of the 20/20 investigation. Two days after the story aired, USA Swimming apologized in a letter to its hundreds of thousands of swimmers, parents and coaches across the country and pledged to implement child protection safeguards. Since the investigation, more victims have come forward from the shadows and shame they've lived with for years to tell their stories. At least two additional USA Swimming coaches have pleaded guilty to sexual misconduct charges with young swimmers and more are under investigation. CLICK HERE for continuing coverage of "The Coach's Secret."